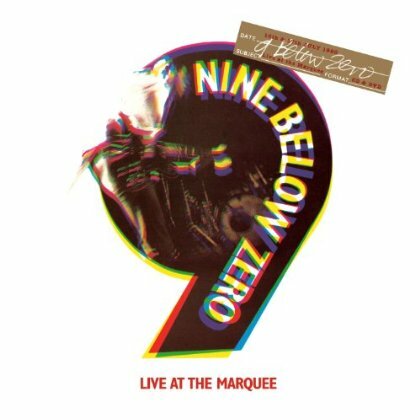 Discussions Magazine Music Blog: NINE BELOW ZERO/Live At The Marquee: Expanded CD/DVD Edition available NOW! NINE BELOW ZERO/Live At The Marquee: Expanded CD/DVD Edition available NOW! Digitally remastered and expanded two disc (CD + NTSC/Region 0) edition of this classic 1980 live album from the British Blues rockers. Nine Below Zero’s debut Live At The Marquee notoriously captures a hard-working, constant-touring London blues band at the peak of their powers and highlights just how intense and electrifying the atmosphere at one of their gigs was. Originally released as a 14-track vinyl LP and without the 7 bonus tracks featured here as the encore the show has never before been available commercially in its entirety. All 21 tracks have been newly remastered in partnership with the band. The package also includes a very special bonus DVD featuring live footage from their incredible Marquee show again, none of which have been previously released commercially. The booklet includes sleeve notes from various band members and others associated with Nine Below Zero as well as a selection of exclusive and very rare photographs.